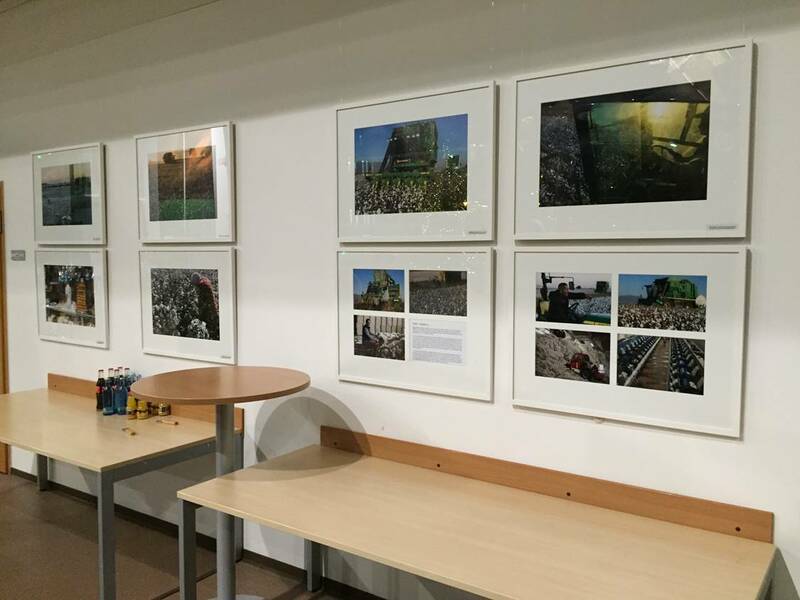 A photo and text ehxhibition by Jörg Böthling (photos) and Dierk Jensen (text). 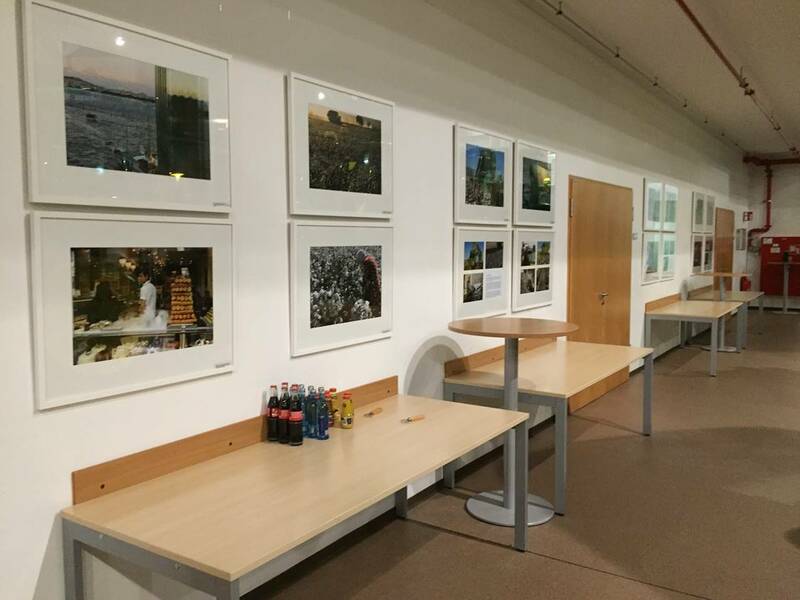 A photo and text ehxhibition by Jörg Böthling (photos) and Dierk Jensen (text). Jörg Böthling and Dierk Jensen have been working as a team for many years around the world. In germany and in and also in a lot of other countries. They spoke with agriculturalists and farmers around the world and watched them till their fields, plow, sow, weed, water, care and harvest. Through their travels in diffenrent climates they got to see a a fascinating variety of agricultural crops: cotton, rice, pepper, rose, cork, chilli, sugar cane, coco and punpkin – just to name a few. They experienced crass differences. While in some places modern agricultural technology is at work, elsewhere the buffalo is still pulling the plough substituting machines and muscular strength. But no matter the methods of hravesting: this exhibition shows the variety that exists and grows on the fields of this world, year after year, season after season. 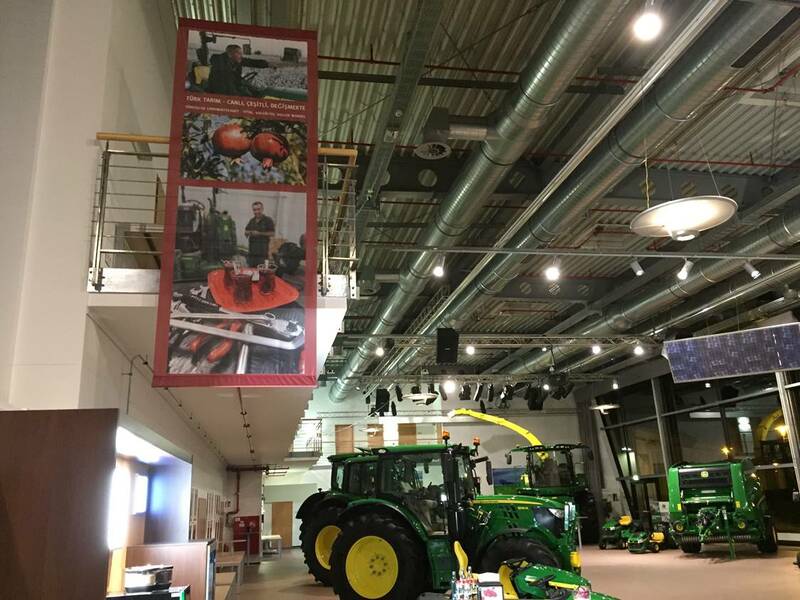 This exhibitions show known and unknown cultural landscapes nad tries to capture the social, economical and ecological importance of agricultural work. It is a silent homage to the global agriculture and ist very different players, that use agricultureal crops for nourishment and healing and as a stimulants as well as industrial and energetic uses. There is no doubt: Agriculture produces the basis for all wealth: life itself. 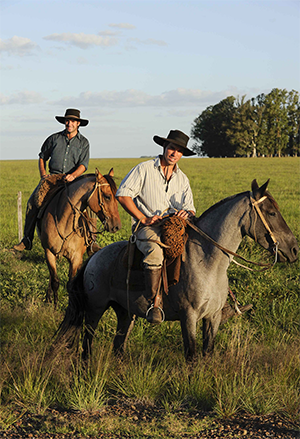 In the year 2011 Jörg Böthling and Dierk Jensen travelled all over Uruguay for a report. They got to know this impressive country, in which a traditional, proud and vital agriculture resides. 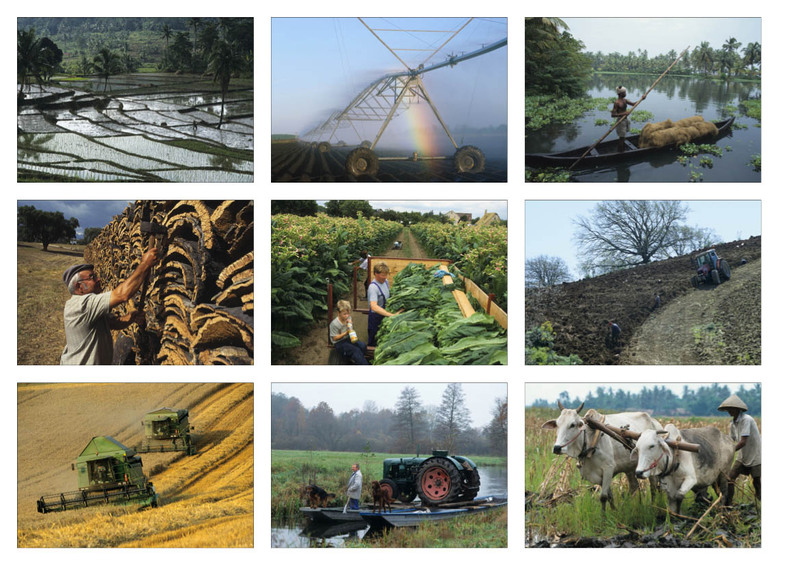 The agricutural sector still play a major role in the economy of this small latin american country. More than every tenth peso is earned on the fields and plantations of Uruguay. At the same time traditional ways of utilisation like the extensive animal breeding are in deep change. Sheep and cattle, tended by riding gaouchos, still grazes on endless meadows, but there are changes to be observed everywhere: Cattle is fatted with corn and concentrated feed at big pens, called „feedlots“, in many places. In many regions there is also inteisve dairying. Furthermore the traditional animal breeding is in a strong competition with farming and forestry. Products from Uruguay like rice, soy and wood are sucessfully exported around the world despite the powerful competition from neighbroing countries. The cultivation will take up more space in the future. Connected to this is a breathtaking mechanisation. This exhibition gives an insight into the current cultivation east oft he Rio de Plata and tries to capture the tensions between old and new. Reports from india by Jörg Böthling, Dierk Jensen and Michael Kottmeier „India took hold of me“ says Jörg Böthling „in autumn I have to go again!“ For years the member of „agenda. Fotografen und Journalisten“ has ben traveling to the indian subcontinent, always looking for new themes, pictures and moments. Michael Kottmeier and Dierk Jensen, also from agenda, repeatedly made the acquantance with the „phenomenon india“ as well. All three combine their encounters, their experiences with India and the indian people in this exhibition. Warum nun aber „Geschichten zwischen Tee und T-shirt“? The three exhibitors did journalistic work in india around social and economical topics: organic cotton, ecological tea and spice cultivation, child labour in the rug insdustry, jute and others: This way „stories between tea and t-shirt“ came to life over the years. Topics that dicuss indian products that are highly sought after abroad, but don’t generate any wealth fort the „simple“ people. 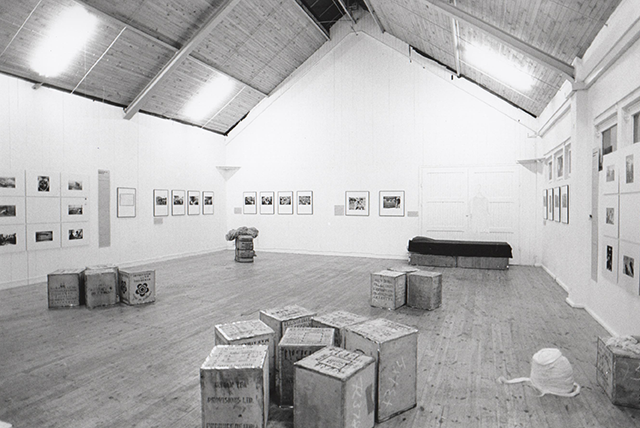 This exhibition therefore traces the way from the tea garden to the cotton field to the tea bag or t-shirt and tries to show the images behing the images as well as snapshots of the indian reality, that was not the result of direct journalisitc work. Scenes were carriers are cursing while crossing the howrah-bridge in Calcutta, where workers disappaer in the noises and the dust of a jute factory, where people travel in uterrly full suburban trains and where in silence worlds of gods form out loam. In a way the exhibition „indian stories between tean and t-shirt“ show the rarely featured everyday but not less interesting pictures of an exciting country. Montevideo is tangos cradle. At the beginning oft he 20th century in the bars and streets of the capitol of Uruguay dancers started moving to a music, that developed from a fusion of African, Latin-American and European styles and rhythm. The world travelling and not tango dancing photographer Jörg Böthling had himself inspired by the metropolis at the Rio de la Plata and followed the magic of tango. This led to pictures that one the one hand show the beauty of the city and on the other hand tell a stroy about the familial and admirable unpretending atmosphere of the local tango-culture. In short: Jörg Böthling presents an enjoyable collection of pictures, which give a contemporary insight into a city, in which tang once learned to dance. 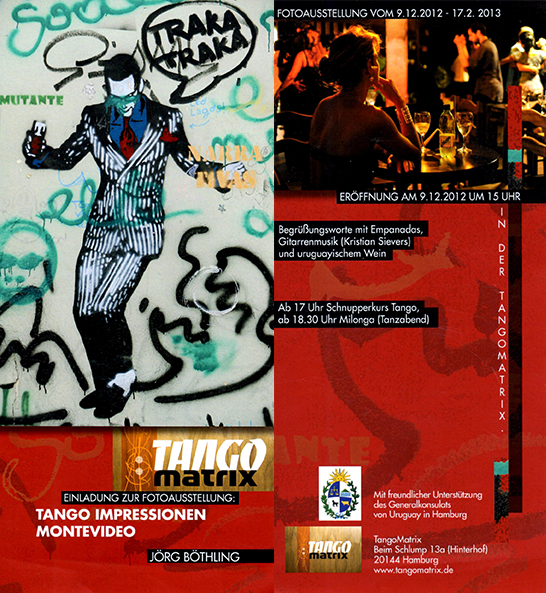 The pictures will be seen at the, in the tango scenen know, tango school Tangomatrix. Bombay ist the centre oft he biggest movie industry in the world. Hence the name „Bollywood“. The stuff indian dreams are made of is produced here. Large scale movie posters transport the movies messages to the streets of Bomby and lure visitors tot he cinemas. Formerly every poster was painted by hand, theses days only a few poster painters remain. One of them is mistry from the studio Ellora Arts. Photographer Jörg Böthling and author Dierk Jensen visited him. 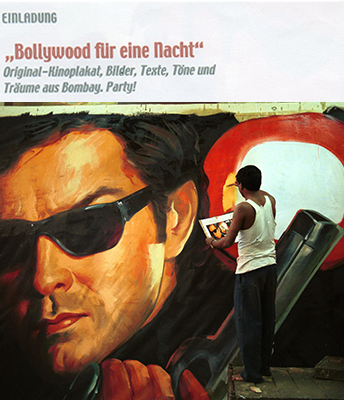 The encounter gave them an insight into the world of indian movie business, which they ehxhibit in the gallery Kunststück with „Bollywood for one night“: Movie posters, pictures, texts and sound from the contradictory megacity full of illusions. Afterwards: Bolllywood-Party.